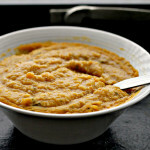 Eggplant and Lentil Stew with Pomegranate Molasses – Eat.Live.Be. for a Better 2011! Whenever I go home to visit my parents, I become a version of my future self. I lecture about the virtues of eating the rainbow. Scream when I see their counters littered with Entenmann’s cakes, Oreos, and loaf upon loaf of white bread. Go balls-to-the-wall crazy when I open their fridge and find not a single vegetable other than Iceberg lettuce. Then comes dinner time. At which point, I refuse to let anyone leave the table until they have eaten all of their veggies. And then feel perfectly entitled to send people to stand in a corner and think about what they’ve done when they fail to comply. I wasn’t always this way, however. Backtrack about four years ago. And I could not have told you what a butternut squash was (the HORROR). I had never eaten a sweet potato. And certainly nothing as green as kale or swiss chard had ever touched my lips. And now? Other than celery (which is the devil incarnated, I’m convinced), I will eat just about any vegetable you put in front of me. With glee. So what changed? My mindset. I wanted to lose weight at the time. Calories in v. calories out. And you get more bang for your buck when you eat a plate full of veggies than you do when you eat a bowl full of Easy Mac. Truer words were never spoken. This obviously didn’t happen overnight, though. It took time and effort and a lot of forcing myself to just try things over and over until I decided I liked them. 1. Go meatless! For at least one meal a week. And with your remaining meals, try using less meat and bulking up dishes you already love with some vegetables or legumes. By slowly incorporating vegetables into dishes you already eat, you may not notice them as much. I’m also the type of person who only feels satisfied when I eat in bulk and you can do so with MANY fewer calories if you stuff yourself with veggies rather than ground beef! Did I mention this will also save you money? Score. 2. Try something new every week! If you’re reading this, you’re probably a food lover. You probably love experimenting with new recipes and techniques…so why not use this to expand your veggie-eating horizons? Think of it as a challenge…Iron Chef-style. Each week you get a new fruit or vegetable, with your mission being to find a way to prepare it as deliciously as possible. Fun, right? Also, don’t write off a vegetable until you’ve tried it at least three times! Sometimes it takes a while for our palates to get used to new foods or to find a way to prepare a vegetable so that we really enjoy it. Think of it as the difference between eating a raw onion and a caramelized onion. Same vegetable. Totally different flavors. It’s totally plausible that you could love one and hate the other. So don’t give up so easily! What tools do you use to make sure that you eat your five a day? Write and post about it and link up here or write about it in the comments! And check out how the other Eat.Live.Be-ers eat their veggies! Alright. Let’s talk about this stew. Last week, I received 24 8-oz bottles of pomegranate juice in the mail. 24. Can you even imagine how much pomegranate juice that is? I can’t. It was in exchange for me letting the good lovely wonderful folks over at POM publish one of my recipes on their blog. (The oven-fried chicken and waffles with juniper-infused pomegranate maple syrup!) I mean, I was expecting one case of the stuff and then went I went to pick up my package from the mail room, they handed me three. THREE?!?!? Sigh, yes. The generosity is astounding. And since I live in NYC in an apartment only a tad bigger than my pinky finger, I immediately set to making up a batch of pomegranate molasses. Which not only takes up less space in the fridge but is also required for most of the recipes out there that involve pomegranates. Score. Like, for example. This stew. Oh, this stew, which is filled with such complexly delicious flavor. The pomegranate molasses gives it a hint of sweetness and tartness and tang that hits your taste buds from every angle. And it’s veggiefull. And antioxidant full. And will help you to live forever. Hefty perks all around, wouldn’t you say? 1. Partially peel the eggplant so that it has lengthwise stripes (I used a potato peeler for this!). Cut it lengthwise into four pieces. Score each slice on one side with a cross-hatch pattern. Cut each slice widthwise into thirds. Set on a rimmed baking sheet. Sprinkle with salt. Let sit for 1 hour. 2. In a small saucepan, cover the lentils with at least 2 inches of salted water. Let boil, then cover and simmer until tender, about 15-20 minutes. Drain. 3. Coat a medium-sized pot (or stovetop-safe casserole!) with one tbsp olive oil. 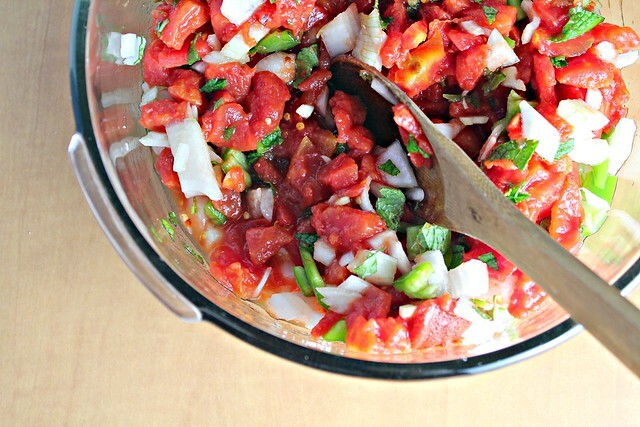 In a large bowl, mix together the onion, garlic, tomatoes, chiles, mint, tomato paste, crushed red pepper flakes, and 2 tsp salt. 4. Rinse the eggplant and pat dry. Spread 1/2 cup of the veggie mixture on the bottom of the pot. Top with half of the eggplant. Cover with half of the lentils and half of the remaining veggies. Top with the remaining eggplant, lentils and veggies. Pour the remaining tbsp olive oil and 1/2 cup water around the side and over the veggies. Drizzle with pomegranate molasses. 5. Bring the stew to a boil. Cover and cook over low heat until the eggplant is very tender, 1-1.5 hours. Serve hot, warm, or at room temperature over polenta, rice, barley, etc. In a large, uncovered saucepan, heat pomegranate juice, sugar, and lemon juice on medium high until the sugar has dissolved and the juice simmers. Reduce heat just enough to maintain a simmer and cook for about an hour or until it has reached a syrupy consistency. It won’t be as thick as regular molasses, but about as thick as maple syrup. Pour out into a jar. Let cool. Refrigerate. 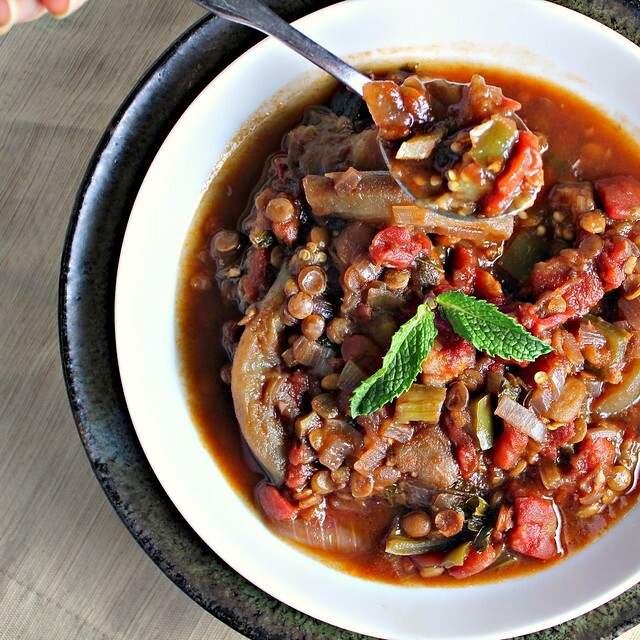 108 Responses to Eggplant and Lentil Stew with Pomegranate Molasses – Eat.Live.Be. for a Better 2011! Eating the rainbow is a great term! Koreans (and perhaps other nationalities) aim to eat meals with 7 different colors since each colored item contributes a different nutrition. While big Mac has many colors it does not count! That’s a great looking stew! My family loves their vegetables, and the meat portions are getting smaller these days. Great use of the Pom. Good stuff! I love the colors in your stew–both to photograph and to please the diner’s eye. And now I have a challenge–“find a recipe for celery that Joanne will like”. I shall return! Pomegranate Molasses? Wow- i can just see me pouring that stuff over everything. pankcakes, bread, pasta, you name it! This sounds out of this world girl! Yum! I wish I had all these ingredients on hand because this looks delicious! Ooooh I need to make some pomegranate molasses! I need to work harder at getting all my vegetable servings in each day… I eat quite a few but probably not enough. Some good stuff in your veggie stew, Joanne. I finally got some pomegrante molasses and can’t wait to try it something other than grilled meat! Love eggplant AND lentils. This is a perfect meatless dinner. This looks great – I love eggplant and Im always looking for new ways to use it. Yes yes yes! I love this recipe! I love how you only used 2 tbsp of oil instead of the 2/3 cup it calls for originally! I prefer vegetable-rich meals. They’re somehow more satisfying, while not leaving me with that “full” feeling. I have more energy, definitely, afterwards. I try to eat as many veggies as possible especially now that I’ve reached and overpassed forties and the kilos are not so easily leave you! This is a beautiful vegetarian stew Joanne! That’s a lot of pomegranate juice, for sure. POM sent me like 8 (6 ounce) bottles once. I gave half of them away and it took me forever to finish off the rest. I mean, I love the stuff, but a little goes a looong way. Oh, and celery? Totally the devil’s work. Nobody else could create something that vile. Just beautiful wholesome food! As always!!! The entenmanns cakes crack me up! There’s something about “getting older” and having those boxes laying around in the kitchen! LOL! My husband is a celery hater as well. I always thought it was funny because to me it has no taste whatsoever. Now I see he has company. I love pomegranate molasses and this stew look simply splendid! As for the veggies: I don’t really have a problem getting mine in as I love them. I’m a lettuce person (yes, those exist!). Of course, to make salads and soups more enticing to the hubby, there must be some cheese/sour cream involved 😉 That does the trick. Words to live by. Love the stew! Hey, whatsamatta with celery? It makes the perfect vessel for peanut butter. ? You are the best and most humorous cheerleader for healthy eating that I know! 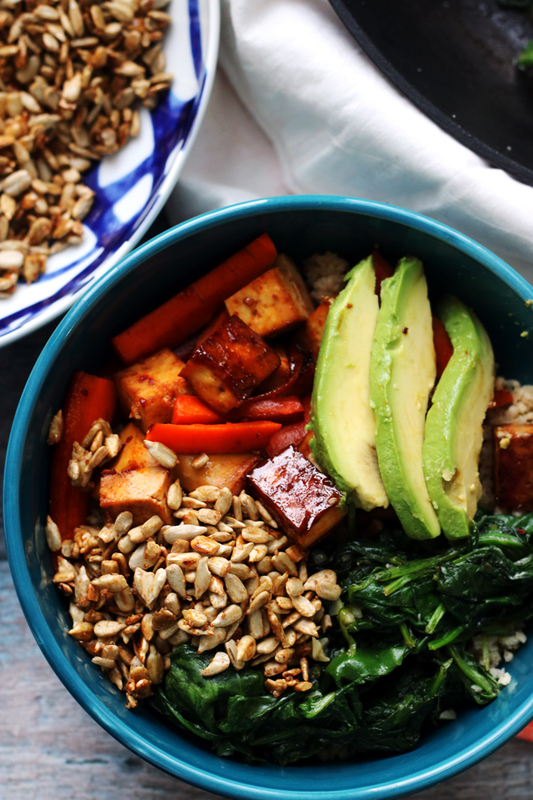 What a beautiful bowl of healthy goodness. Amen. I just finished my bottle of pomegranate molasses and never thought to make my own. Thanks! This looks SUPER good! I am sure my husband would love this as he loves eggplants :). I love the three strikes before you’re out mentality. Guess I better give those kumquats another shot. this is such a great post. your advice is awesome, i need to try a meatless week, i could see it easily turning into a meatless month. love this dish! That stew is a treat to the eye.The ingredients sound so comforting.I love both eggplant and lentils.This is supelike!! You always come up with the most creative and delicious recipes! 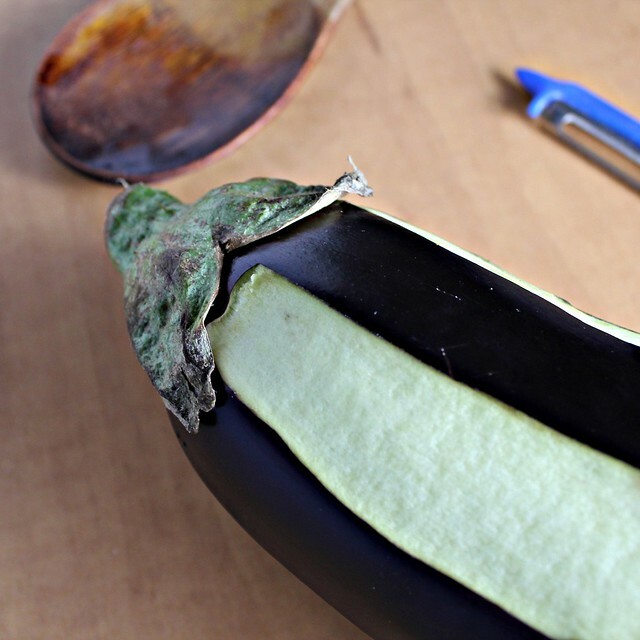 I need to try eggplant again… I had a bad experience as a kid and haven’t tried it since. Eggplant and lentils will be awesome combo. I know they taste great. that pomegranate molasses sounds delicious too. I am a fan of eggplant, and love stew! Too bad I do not have all the ingredients at my discretion to make a batch for the family tonight. Joanne, this stew looks warm, flavorful and absolutely wonderful! Great recipe. Thanks for sharing! I’ve never tried pomegranate molasses — must try. 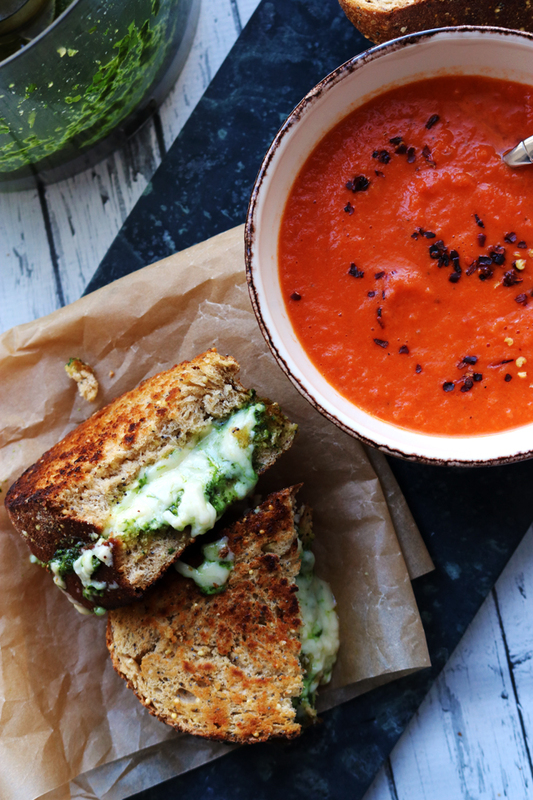 This recipe is so healthful and delicious-looking. POM is a great product …thanks for your pomegranate interpretations, which are all yummy. I’ve probably said this before but I cannot resist anything with pomegranate molasses, I simply adore the stuff! This sounds so delicious, it has everything I love! 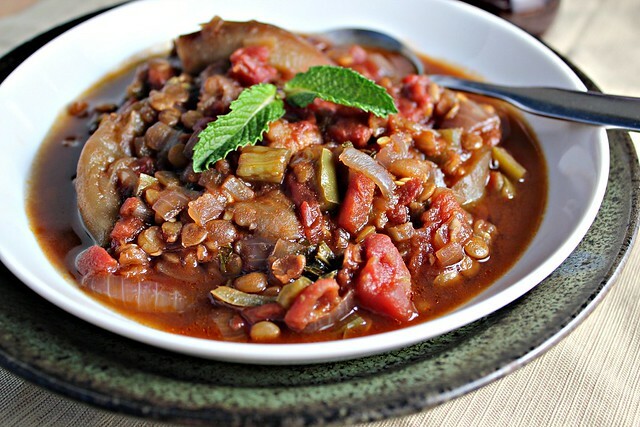 Joanne, your lentil dish with eggplants and specially pomegranate molasses look delicious…what a lovely flavor! That stew looks gorgeous. I’ve never tried pomegranite molasses but I think I’m going to have to hunt some down now! I could do that – eat all those lovely vegetables, very happily, and skip the meat…. However, with the hubs being without a pancreas, it makes it a little more challenging. I, who normally trim every bit of fat off the meat, now leave it on to feed him to help keep his weight up. Dinners are a challenge, chez nous. I’m still thinking about the Oreos, tho…. It’s been years…..
Dang, three whole cases of pomegranate juice? Time to break out the Pomitinis! The stew you made looks absolutely gorgeous, I’m sure your family must have been thrilled when you walked in the door with it. That’s so funny that you mention standing in the corner as a punishment, that was always mine growing up! 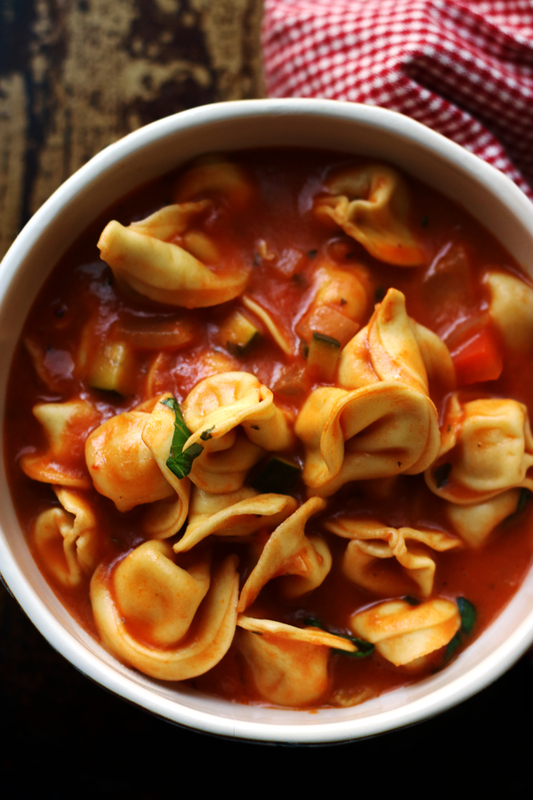 As I have probably mentioned one too many times, I love soups and stews way too much. I also particularly love lentils. Really interesting with the Anaheims, eggplant and pomegranate molasses. Yes, I would like a stew that will help me to live forever, and I already really like lentils and pomegranate molasses! I’ve been doing the five a day thing for years. At first, I wrote down each veg and fruit serving to be sure there were five each day, and now I just think back through the day and count them up in my head. I love it when the total is way more than five! 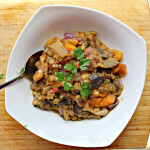 This looks like a fantastic combo of veggie and lentils. I love eating a rainbow..my dad who is a scientist says that often but its difficult to eat that way all the time! That just looks fabulous, Joanne! 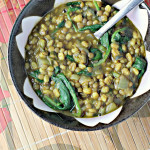 I love cooking with lentils and this dish sounds delish! I haven’t ever heard of pomegranate molasses. It sounds amazing though and I’m always willing to try new things. I can’t say that I actually eat all the servings of things that I’m supposed to eat but I try! You are always have such wonderful, *practical* ideas for good eating. The meatless option is one that I definitely want to follow – and who doesn’t love colourful veges on their blog? And your eggplant stew looks particularly luscious! I am super happy to see the pomegranate molasses recipe here. I have been looking out for some lately for a couple of recipes I saw online, but haven’t been able to find it anywhere. I’m so glad to see that you can actually make it. Thanks so much! Wooohooo, I did not know my family (parents) is almost like yours. Whenever I visit them, I miss my vegetables! Dinner is sometimes “other food” (seafood, poultry) PLUS one plate of veggies shared by 5-6 people in the family. I miss my vegetables. I try to go meatless at least one meal per week too and make sure I have at least “red, green, orange” in my vegetable compartment as regulars. Saw your tweet about playing with pom molasses last week. Lucky you to end up with this great meal. 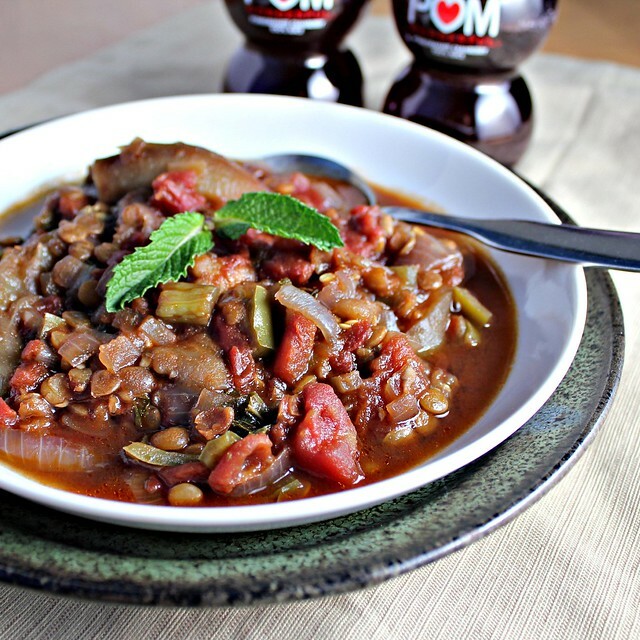 Love the combo of pom and lentils. Have you ever had fesanjaan? You can definitely whip up an eggplant fesanjaan if you have more pom juice or pom molasses around. haha, I am the same way (though you knew that) always encouraging them eat healthy and exercise. I don’t want them watching their (someday in the far off future) grandkids, I want them rolling on the floor and running around! A girl can wish. I can also wish I had a bowl of this amazing stew in front of me. I think I’ll make it happen, next week. That pomegranate molasses in my fridge has been feeling pretty neglected. i would be SUCH a good eater at your dinner table haha. probably the first out of the table because my vegs would be the first to go! In order to be satisfied after a meal I have to eat bulk too! I am so much happier if I can stuff myself with veggies. Your parents will thank you when they are 150 and diabetes free haha I have slowly but surely started shaping my parents into the people they should be too. love pomegranate molasses! Lucky you, you must have enough for the year! 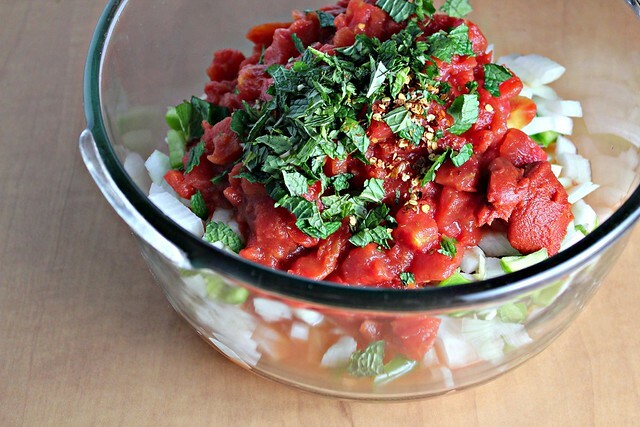 Can’t wait to make this stew, delish! Oh my…that looks absolutely delicious! I’ve never had pomegranite molasses but I’m sure it’s fantastic. I would totally love this! Looks like a wholesome and satisfying meal..love the combo of ingredients..great recipe as always..thanks for sharing! Your timing with this recipe is impeccable! I just bought an eggplant with something stew-like in mind, but no particular flavor profile. I like the use of mint and pomegranate molasses here, two ingredients I really should employ more often… This sounds perfect! Yummy stew – and great post on eating your vegies. I frowned at E last night because we only had broccoli with our bangers and mash – I told him I prefer more vegies but it wasn’t too bad. I identify with a lot you say about more vegies = eating more food and less calories, and more healthy food. I also love to eat lots of different colours because they look pretty but it also means getting a good range of nutrients in your dinner because different colours in veg often mean different nutrients. And while I am on the nutritional bandwagon, going meatless does not mean not eating protein and should not mean this if you want to remain healthy – if you eat your legumes, like in this dish, you get both veg and protein – easy way to get in your nutrients. And I think easing vegetables into your life by mixing them in with a stew is a good way to appreciate them. I could go on and on because I love vegies but I will stop now !!! I’m with you on the bright colours – the more, the better! It feels wrong to just have one or two veggies in a meal. Heh. Also, with you on the celery issue. Although, actually I find it’s quite palatable when cooked and mixed with bacon, butter and spaetzle. But brusselsprouts have just never been able to win me over, no matter how I’ve tried. This aubergine stew? Magical. I need to get me some aubergines stat! 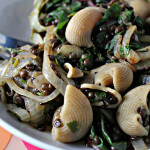 This looks like a wonderful bowl of sweet/savory goodness–so loving the lentils. 😉 Thanks for sending it to Souper Sundays. You sound like me at my parent’s! I’m always disappointed in their stashes of food!! Growing up, I rationed butter, salad dressing, etc. My dad has NO portion control, at all. We traveled to Vegas with my parents last weekend and every meal he HAD to order something in addition to his entree…onion rings…appetizer…3 martinis. The man has a serious portion control issue and it drives me nuts! Sometimes I think he does it just to tick me off. I had a similar journey as you (weight loss helped me discover my love for veggies), and it’s amazing how much my perspective on vegetables/ food has changed over time. I really learned to appreciate food and my body more when I started making things that weren’t filled with crap. My own daughter is at university to become a dietician so I hear these types of things all the time. Could I say she lectures me…yest I could. What a great journey! I love veggies (eggplant especially – so trying your recipe), but tend to get in a veggie rut…love the “rainbow” advice and am definitely going to keep it in mind. Pomegranate Molasses? That sounds delish. So do the lentils, and the eggplant. So it’s only 7:30 am here, but I’m totally craving. I grew up in a health-food-only household, but it’s still fun to inspire them to use new-to-them ideas like kale, lentils, collards, green smoothies, detox etc. They’ll come around when they realize how amazing they feel! Joanne, where did u get such brillant ideas from? I love a hearty meal like this- esp with my fav vege eggplant! This looks wonderful and can I use the already bottled pomegranate molasses? Wow what great tips and your recipes are always so delicious looking! Oh thank you for reminding me of the pomegranate molasses I bought! Hopefully I can use that instead. Love the combination of pomegranate with eggplant. Must be such a hearty, bold meal :). This stew sounds so flavorful and delicious with pom molasses! I just bought some pom molasses too, I need some ideas of what to use it in. I like rainbow eating…that’s why I bento. This is lovely. This looks delicious Joanne! I really need to make more effort to link up to Eat.Live.Be. and the Meatless blog hops. I eat such nice healthy stuff compared to what my guys like, and it’s their stuff that usually ends up on my blog! I was like you with veggies. I was in my early 20’s before I even even tried a green veggie believe it or not, and now I eat more veggies than anything else. I can’t get enough of them! Looks so healthy and delicious. Pomegranate molasses is one of my favorite ingredients as well. I really should be eating more healtily, but I love meat! Celery is NOT my favorite veg either. It takes entirely too much effort to munch through and the strings get caught in my teeth. Most bothersome! I too became a veggie lover later in life. Now I can’t get enough. 🙂 Splendid stew! But this looks delicious – and hearty enough to convert a meat-lover. This sounds like something we would love for dinner especially w the pom flavor. How very interesting! The pomegranate molasses sounds positively dee-licious! You might even get me to eat lentils with it. Extra for me, please! I can’t agree more… you can never have too much color. Not only is it healthy for the heart, but it’s great for the soul. Thankfully, my whole family LOVES veggies. In fact, we often compete to see who is eating the most. I usually win, but I need to work on variety. This dish would be a great way for me to incorporate one of my old favorites…eggplants. Thanks for sharing this with me tonight. Food and cooking has brought me much comfort during these hard days. Your blog is a burst of brightness. I hope you have a happy and safe Wednesday. Hug the ones you love! I have to admit I don’t eat my fair share of veggies but that may change if I made this dish at home. I have never seen veggies look more gorgeous. I have a confession to make, I don’t eat nor veggies a lot in our household too haha.. your story reminds me of my daughter when she comes home… I call it reversal of roles… haha! but this steew looks good, I may change my mind about eating veggies. Haha, you are just showing your love in a food Nazi way. 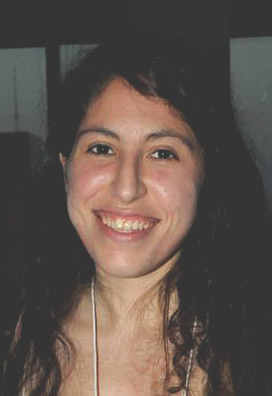 Love you, Joanna. funnily enough, while I don’t adhere to nutritional practices myself, I get super concerned with my family’s diets. I want them to eat well, but don’t care as much for myself. I have issues. I’m afraid that I am like this with my in-laws. They are life-long carnivores who do nothing but complain about their ill health, excess weight and lack of money. To me the answer to all their problems is obvious, but it takes that one step. The exact step that you took, for people to realise it really isnt that difficult to make life changing decisions. Seriously Joanne? Are you sure we don’t share parents, because I have all the same experiences. In fact, I’m sure they’re really happy when I leave. I’m loving all these healthy recipes. Oh, and I may take you up on that math help offer! I love vegetables but probably do not eat enough each day. This summer we are joining a CSA and I’m looking forward to eating lots and lots of fresh veg. 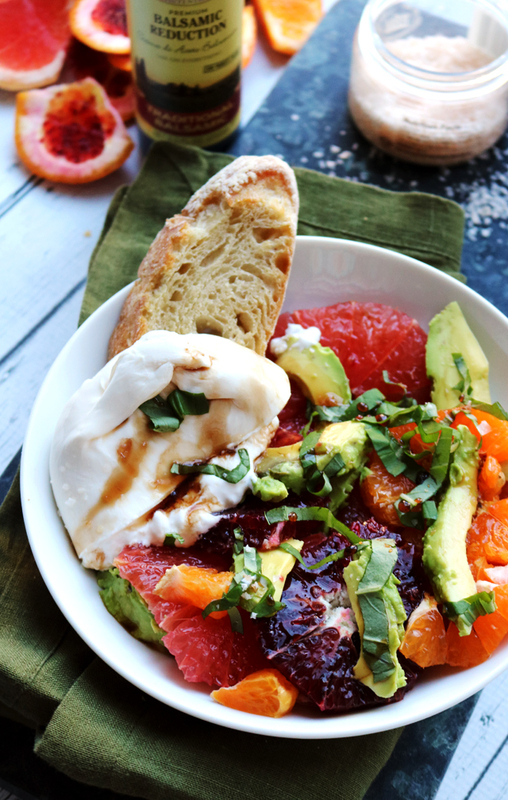 This looks great…love the pomegranate molasses. Very creative! You made pomegranate molasses? Yay! I made it last November and love the stuff. Looking forward to what else you’ll make with all that juice! I’ve been following your damn “eat the Rainbow” diet all week and haven’t lost a pound. In fact I gained 5 lbs….and I am so sick of Skittles. When I shifted into healthier eating, I would eat things just because I knew they were good for me and eventually I either started to like them, or just got used to eating them. This sounds like such an interesting stew! I imagine the pomegranate molasses makes it really yummy! This recipe combines vegetables and beans a good combination. My husband loves lentils and they are so healthy.